Library image #4056: A view of Strawberry Mountain Wilderness from John Day Valley. The United States Congress designated the Strawberry Mountain Wilderness (map) in 1964 and it now has a total of 69,517 acres. All of this wilderness is located in Oregon and is managed by the Forest Service. This high-country rugged Wilderness contains five of the seven major life zones in North America. Glaciation hollowed out beds in U-shaped valleys that today hold seven alpine lakes. Elevation ranges from about 4,000 feet to 9,038 feet atop Strawberry Mountain in the east-central portion. Large numbers of larch, the only conifer to lose its needles, turn to gold in fall, highlighting a forest of spruce, pine, and fir. Accenting the gold hues are wild strawberries that ripen to juicy redness in July, and mountain basins blooming with summer wildflowers. 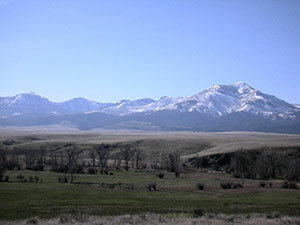 A native population of Rocky Mountain elk reside here with mule deer, antelope, black bears, cougars, mink, and beavers. Martens and hawks watch the wildlife action from on high. There is approximately 125 miles of trail within this wilderness which offers room for backpacking trips of a week or more. The trails take you through a variety of vegetation changes including remnants of past wildfires, the most recent one being in 2013. Planning to Visit the Strawberry Mountain Wilderness? How to follow the seven standard Leave No Trace principles differs in different parts of the country (desert vs. Rocky Mountains). Click on any of the principles listed below to learn more about how they apply in the Strawberry Mountain Wilderness.